SCR and Mounting Kit. Commonly used in the ComutaCar Automatic Charger, this is an upgrade over the lower current original part. Complete with mounting instructions this can be used in many applications utilizing an SCR controlled circuit. 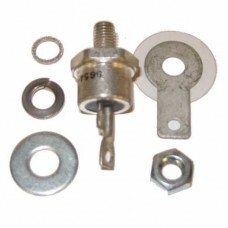 Includes insulators for isolating from chassis. Note: When available, we are using an SCR with built in isolation. These are very difficult to aquire but simplify installation by eliminating the need for seperate insulators. Functionally, these parts are identical.